The border between the US and Canada does not provide an example for how to solve the issue of the future border on the island of Ireland after Brexit, Taoiseach Leo Varadkar has said. British Prime Minister Theresa May told parliament today that the UK would look at many examples of different arrangements for customs around the world, including the border between the US and Canada. "That is definitely not a solution that we can possibly entertain," Mr Varadkar said this evening. Mr Varadkar said he had not heard Ms May's statement in Westminster. 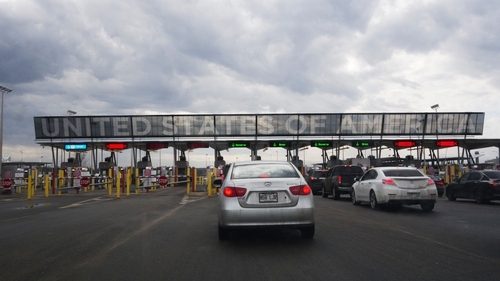 However, he said after visiting the Canada/US border last summer it was clear that it was a hard border with visible infrastructure and customs posts. Mr Varadkar has also ruled out formal three-way talks between the UK, Ireland and the EU to look at the Mrs May’s Brexit offer. Mr Varadkar said it was not in Ireland's interests to take part in such talks regarding the withdrawal of the UK from the EU, and that what was needed was for Downing Street to produce more detailed proposals. Yesterday, Mrs May suggested Mr Varadkar had agreed to form three-way talks to look at the border element of the proposals she outlined on Friday. Mrs May set out her strategy for negotiations on the UK's future relationship with the EU in a high-profile speech in London. It will be put to the test this week as negotiations between British and EU officials resume in Brussels. However, Mr Varadkar said: "There won't be tripartite or three-way talks. "What will happen is that there will be talks between the EU 27 and the UK, and Ireland is part of the EU 27 and we're much stronger by the way as one of 27." Mr Varadkar added consultations could take place between the two governments about issues that are unique to Ireland. "We will of course have negotiations about what could be done to avoid a hard border, but what we won't be getting into is a negotiation with the UK, or a three-way negotiation," Mr Varadkar said. "That's not in our interest and not the way that this can be concluded." Speaking on RTÉ's Morning Ireland, Mr Varadkar said that he gave Mrs May's Brexit speech on Friday a guarded welcome, but that detail was now needed from the British government. "What we want is not so much principles and aspirations and red lines," Mr Varadkar said. "What we want is detail, written down in black and white that can be codified into law and that is what is required." Mrs May has rejected EU proposals that would see Northern Ireland kept in an effective customs union with the EU as a fallback in case other solutions cannot be found. She has proposed technological solutions and an exemption from new restrictions on the 80% of cross-frontier trade carried out by smaller businesses. A Sinn Féin delegation, led by party leader Mary Lou McDonald and deputy leader Michelle O'Neill, has held a one-hour meeting with the EU's chief Brexit negotiator Michel Barnier in Brussels. Afterwards, Ms McDonald said the meeting had been constructive and both sides had agreed on the need to protect the Good Friday Agreement and to avoid a hard border post-Brexit. "I believe Mr Barnier gets it," said Ms McDonald. "He understands the need for legal clarity. We shared with him our frustration with the British government, the fact that Theresa May - far from progressing things - has rowed back to positions that they know are unworkable, that they know are unacceptable. "They were unacceptable last August. They're unacceptable now." Ms McDonald called on the British government to put "concrete proposals" on the table as to how to avoid a hard border. "There will be no advancement, there can be no withdrawal agreement, no agreement whatsoever, without a legally secure resolution to the Irish question," she said. "Any suggestion of backsliding or rowing back from the 'backstop' solution is simply not acceptable. "Europe has set out the parameters of what they understand to be a reasonable, and legally robust arrangement. We believe they will stick by that. "Rather than making speeches to settle the Tory party, it's now time for the British government to be constructive." The Sinn Féin leader said that special designated status for Northern Ireland within the European Union was the still the optimum solution in the party's view. Speaking to RTÉ News after the meeting, Sinn Féin's leader in Northern Ireland Michelle O'Neill said the party did not want to see a border on the island or Ireland, or on the Irish Sea. "The backstop is the guarantee that the people on the island of Ireland have," she said. "If the British government don't like that, they created the Brexit scenario so they need to bring forward workable solutions." Mrs O'Neill said that there would not be a meeting of minds between the DUP and Sinn Féin on Brexit. "They have signed a blank cheque to the Tory government. 'You have a carte blanche. Work away and we'll support you at the end of that', That is not what the people of the North voted for," she said. The leader of the DUP Arlene Foster will meet Mr Barnier in Brussels tomorrow morning. Later tomorrow President of the European Council Donald Tusk will set out draft negotiating directives for the future trade negotiations between the EU and UK. They are expected to be limited in scope and to use the EU's trade agreement with Canada (CETA) as a starting point when phase two of the negotiations get up and running. Meanwhile, Minister for Finance Paschal Donohoe has said it is critical for Ireland that there is a strong backstop in place in relation to Brexit to manage many of the developments that could take place during the process. Minister Donohoe was speaking on a visit to London where he met the British Chancellor of the Exchequer Philip Hammond and Minister for the Cabinet Office David Lidington, as well as Labour Shadow Chancellor John McDonnell.